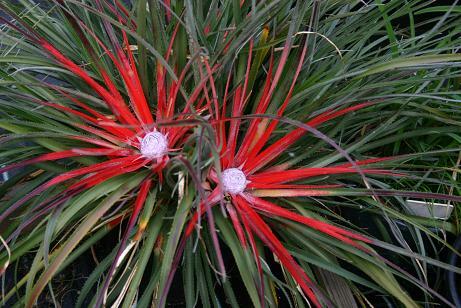 A ridiculous hardy bromeliad with shocking red leaves surrounding the flower heads. 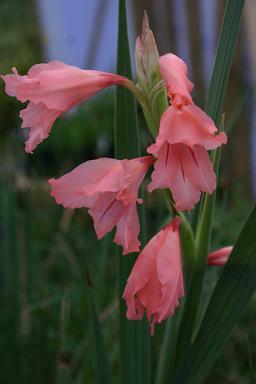 It likes full sun and decent drainage but not too fussy otherwise. Provides a ludicrous prickly punctuation in the soft mellow whisper of autumn. 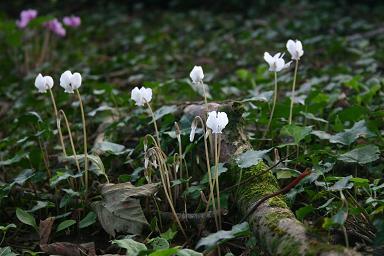 The first of the Cyclamen for the season. I have a small colony under the trees at the top of the garden, and they slowly spread by seed. Most of them are pink, because I always select the deepest colours when I add new plants, but I have a couple of white plants which are very elegant among the silvery brown fallen timber, but this is only september and the deep pink forms are funnier, like an Essex girl leaning against a multi-storey car park. I have been watching the growths emerge from the pot all summer, and I didn't think there were any that were sturdy enough to flower, so I was delighted to find a single flower spike. Seems to be fairly hardy here in a cold greenhouse. 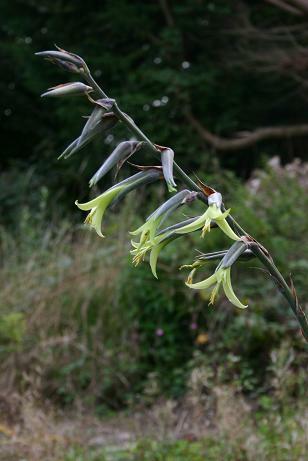 Puya laxa x mirabilis . Also coming into the category of odd bromeliads, this one spends the winter in a cold greenhouse and the summer outside. I can't see the influence of P.laxa in the flowers, but the leaves spike my fingers more viciously than P.mirabilis (not a particularly reliable taxonomic character, but very practical and immediate).